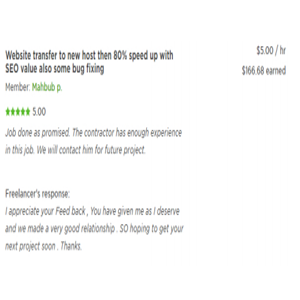 This is the recent review of our clients, you can find more at our upwork profile ByteCode (Digital Marketing Firm). We invest and solve customers’ problems, which may be complex or long-standing problems. We learn about our organisation’s products or services and keep up to date with changes and many more. Your quality of work is too good and great timing as well. I am very satisfied with your work. Job done as promised. The contractor has enough experience in this job. We will contact him for future project. Just fill-up the contact form or call us at +88 01716 988 953 or +88 01927 711 980 to get a free consultancy from our expert or you can directly email us at info@bytecode.com.bd We would be happy to answer you.